Throughout this years to commemorate the fallen of the 1914-18 war the Urban Arts Centre, DJ School, Verbal Arts and Quhwah Publications will be collaborating on a ground breaking project. The local organisations have come together with funds from the Heritage Lottery and local businesses to bring their unique and specific expertise to this very import project. Remembrance Poets is the brain child of Gary Oliver internationally renowned local poet who found fame with his Books Woodun Indians, Dear Love Powa and Contemporary Common Criminal. 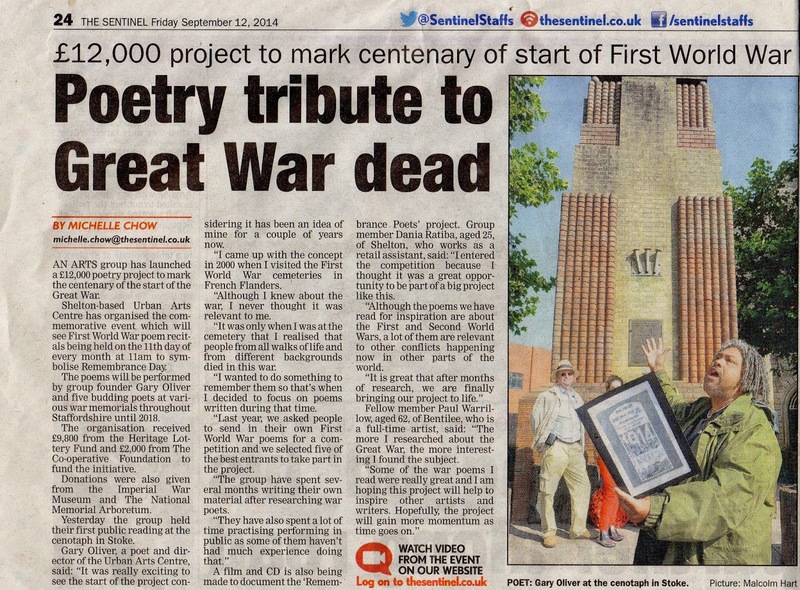 The group based at the Urban Arts Centre, Stoke-on-Trent have been creating and reading poetry inspired by WWI poets, with the theme of conflict and resolution, at various memorials throughout the region.